The Kindle may not hold a candle to the iPad as far as tablets go, but its rechargeable battery puts even Apple’s rechargeable batteries to shame. The Amazon Kindle is to books what the iPod was to iTunes and .mp3s. More than anything, the tablet is a proprietary gadget for Amazon to sell more books with a lot less overhead. Sure, you can read .pdfs on it, and its 3G wireless technology lets you download books everywhere from Sydney to the Gobi desert, but if you’re not a bookworm, the Kindle holds little value, particularly when compared to the alpha tablet now dominating the gadget market — Apple’s iPad. As you already know from Steve Jobs’ convocation in January and an onslaught of promotional campaigns, the iPad manages to give users the same ability to download and read books, and then some. While Apple is using the iPad to sell iTunes, apps, and plenty of other stuff like iPad cases and accessories, the iPad is chiefly a comprehensive tablet that offers so much versatile functionality that its applications are almost limitless; the iPad will be used at home, work, or on the go in any number of settings and situations. There’s really nothing Apple can learn from Amazon’s lowly Kindle. Except when it comes to rechargeable batteries. 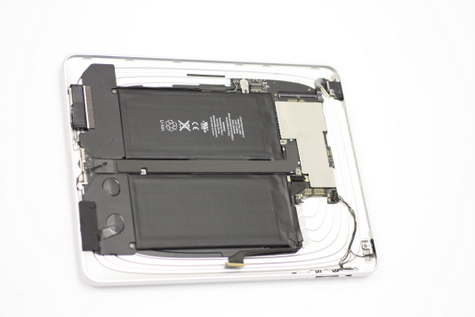 The inner goodness of the iPad's Lithium Polymer rechargeable battery. Rechargeable Batteries are a big part of mobile computing. Apple’s battery for the iPad promises to be a major leap forward. A lot has already been said about Apple’s new revolutionary iPad. While some in the media and the marketplace have questioned whether or not the device has lived up to its hype, the vast majority of tech reviewers and iPad users have gushed about the iPad’s ease of use, innovative apps, and fluid user interface. Behind the scenes, however, Apple has also managed to revolutionise the Achilles heel of all mobile computing — the rechargeable batteries that keep it going. The iPad’s sleek lithium-polymer battery is a leap forward for rechargeable batteries, and — in spite of all the other bells and whistles — its use in the iPad is really the lynchpin in making it the ultimate mobile gadget on the market. Do you really know why NiMH rechargeable batteries are the most eco-friendly batteries in the world? You may be surprised to find out why! Solid Cadmium = Bad for you, Bad for the Environment. Most people these days are aware of the fact that NiMH rechargeable batteries are the most environmentally friendly batteries you can buy on the market today. After all, it isn’t rocket science: rechargeable batteries can be used over and over again, as opposed to alkaline batteries. Because of this, the point at which you finally have to throw out your batteries is greatly delayed compared to disposable batteries, meaning that fewer batteries end up in landfills, polluting the ground and waterways. If this is what you already knew about rechargeable batteries and the environment, then you are absolutely right! However, there is more to the story than just the “landfill” argument about why rechargeable batteries — and specifically NiMH rechargeable batteries — are by far the safest for the environment. 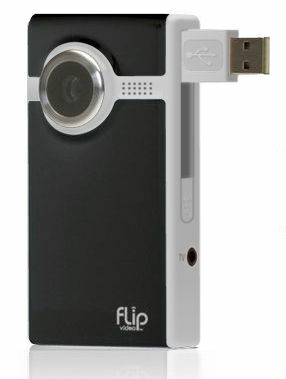 Got a Flip Video Camera? Don’t “Flip” Over Their Rechargeable Battery Pack. Thinking of giving up on rechargeable batteries and getting a rechargeable battery pack for your Flip Video Camera, instead? Think again! It amazes me that the Flip Video camera hasn’t managed to put more expensive video cameras out of business. Its user-friendly features, quality video, and affordable price make it an obvious choice for the vast majority of people who just want to shoot simple videos. Even installing the batteries is simple: the Flip Video takes two AA batteries. Popping them in is as easy as it is with my TVs remote control. But unlike my remote, which can milk two AA batteries for almost a decade, the Flip Video camera can drain a disposable battery in about fifteen minutes. That’s why most Flip Video users quickly realise that using rechargeable batteries makes a lot of sense. Everything these days seems to have a USB port or plug attached to it, and for good reason: as you’ll read elsewhere on the internet, the USB port and its plug offer amazing technological benefits. Most impressively, USB technology offers a kind of “smart electrical socket” that can both provide energy and transmit data simultaneously. The combination of these two features is impressive, which is why new applications for the technology continue to open up. Rechargable battery technology is no exception to to the USB phenomenon. There are quite a few battery chargers on the market today that allow users to not only charge their NiMH rechargeable batteries, but also to recharge iPods, iPhones, digital cameras, and other mobile gadgets via USB as well. In this way, you don’t even need your computer to charge mobile devices anymore, and any gadget that doesn’t use aa or aaa NiMH rechargeable batteries can still be recharged from the same hub as your own set of rechargeables. 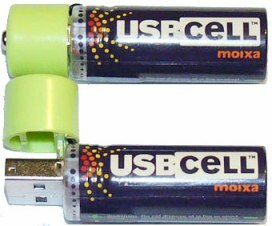 The folks at USBCell, however, have taken this fusion of USB and rechargeable batteries one step further by introducing NiMH-based batteries that charge directly from a USB port. The solid, one-piece battery housing that we’re all used to have been replaced with a nifty cap that flips ope to reveal a USB plug that fits deftly into any USB port. Whether you are a gadget geek or just someone that uses a ton of batteries, it doesn’t take long to realise that investing in several sets of NiMH rechargeable batteries will save you tons of money over the long term. Though rechargeable batteries tend to cost a bit more up-front, their lifecycle far outlasts that of even the most premium disposable alkaline batteries. What’s more, NiMH rechargeable batteries are significantly less damaging to the environment: nickel, the main ingredient in NiMH rechargeable batteries, is easy to mine, plentiful, and much less toxic when disposed of than alkaline batteries or the old NiCD recheargable batteries. When you do the research, NiMH rechargeable batteries seem like the “holy grail” of modern battery technology. But as you know, in life there is always a catch.